Looking out Yeti’s windows into the boreal landscape freckled with pristine lakes and streaked with tranquil rivers, I couldn’t agree more. If there is one place Andrew and I both feel at peace, it’s on the water. Before we set off on our motorhome adventure in Quebec Maritime last spring, we debated taking an additional form of transportation. I was adamant I didn’t want the hassle of towing another vehicle behind our motorhome on our first big RV trip in Canada. We debated borrowing the bicycles stashed in my mother’s barn but decided against it in the end. For the most part, we were both happy with our decision. We never once wished we had bikes, enjoying the freedom of our own feet to get us moving on the many trails we tackled. Occasionally, trying to access places in our 30-foot motorhome was challenging, but not so much that we wanted the hassle of dealing with a tow vehicle. But a boat; a boat would have been a nice addition to our gear. We started discussing practicalities. A power boat was out of the question purely from a financial perspective. We debated kayaks and canoes and how we could attach them to Yeti. The roof would necessitate climbing up and down the ladder to load and unload. There are a variety of racks we could attach to the back of the RV, but we didn’t know how durable or practical they would be. We decided to put a pin in the idea and research it further over the winter when we were stationary for a while. Later that day, Andrew looked up from his laptop. “Facebook is creepy,” he said. Since we had been looking at canoes on his computer, Facebook decided to show him ads for a canoe. But it wasn’t just any canoe. He passed me his laptop, and we knew we had found our boat. It was an ONAK – An origami canoe. 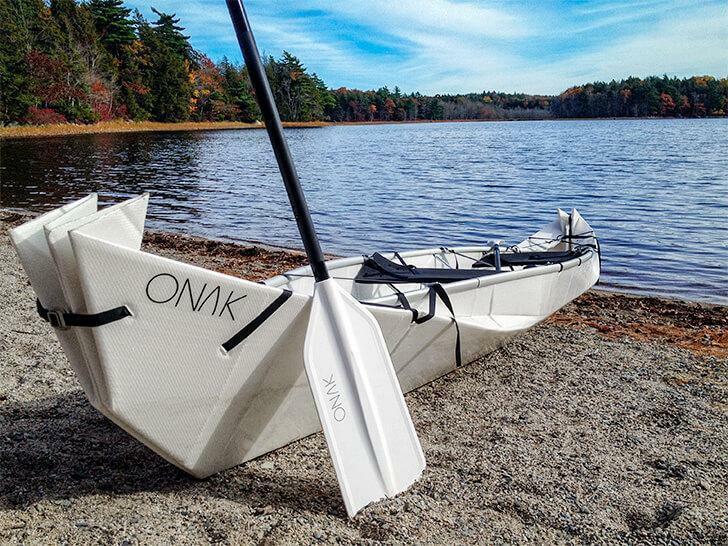 ONAK (cleverly canoe in Dutch, kano, backwards) is everything we didn’t even know we were looking for in a boat. Small – First, and most importantly for us, it is portable. The entire collapsible canoe folds into a box weighing only 17kg (or 37lbs). Plus, it’s on wheels, so you don’t even have to lift it. It fits in our motorhome storage without having to strap it to the roof or back of the machine, meaning we don’t have to worry about it falling off or getting stolen. It fits easily in the back of a car or truck and is even small enough to take on public transportation. Durable – Despite its small size and lightweight construction, the ONAK is surprisingly heavy duty. We put it through some harsh conditions (as you’ll see later on) and it came out with hardly a scratch. It also holds up to 250kg, meaning both of us fit in one boat, unlike many of the other folding boats we researched. Ethical – One of our tenants of Slow Travel is to be as responsible as we can about the products we use. 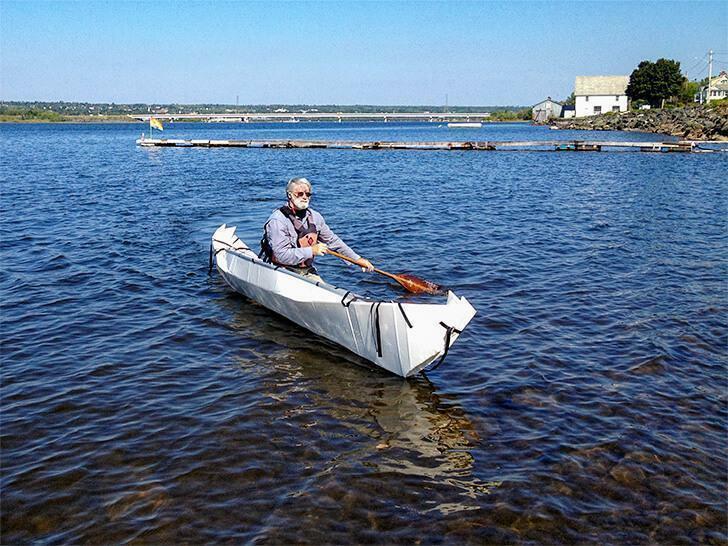 The ONAK foldable canoe is made from fully recyclable materials. The company has a policy of hiring less-employable folks and giving back to their local community. Belgian – We couldn’t resist the link to our other home country. 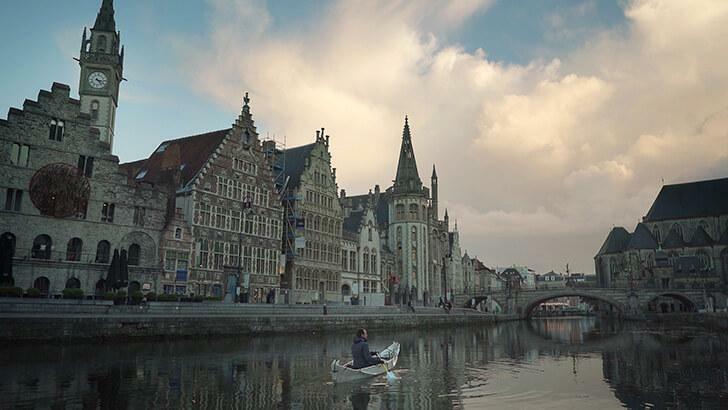 Not only are the creators of the ONAK folding canoe from Belgium, but the entire company is based near Ghent. We were surprised to learn the canoes were made right on site and not in a factory somewhere in Asia. Global – Because we’re no longer based in Belgium, we worried shipping to North America would be impossible. Luckily, ONAK ships to most locations, including Canada and the US. Unique and beautiful – I’m a sucker for great design and there’s no denying our ONAK turns heads. Every time we’ve started to set it up, we’ve drawn a crowd. People want to know what it is, how it works, and where we got it. Yes, our ONAK canoe is a show stopper! The ONAK story began back in 2013 when co-founder and ONAK designer Otto Van De Steene was distracting himself by folding paper origami canoes. He was struck by the idea of building a life-sized fold up canoe. He shared his idea with engineer friend Thomas Weyn and hundreds of paper canoes later they had a prototype. With their collapsible boat concept in hand they took to Kickstarter for funding. It seemed their unique idea struck a chord with outdoor enthusiasts and the ONAK Kickstarter was successfully funded in August of 2016, exceeding their original goal. But it wasn’t just canoeists who took notice of ONAK’s original design. ONAK won the prize for the best innovative product at the Outdoor Show in Friedrichshafen, Germany and a Bizidee award for best business plan. 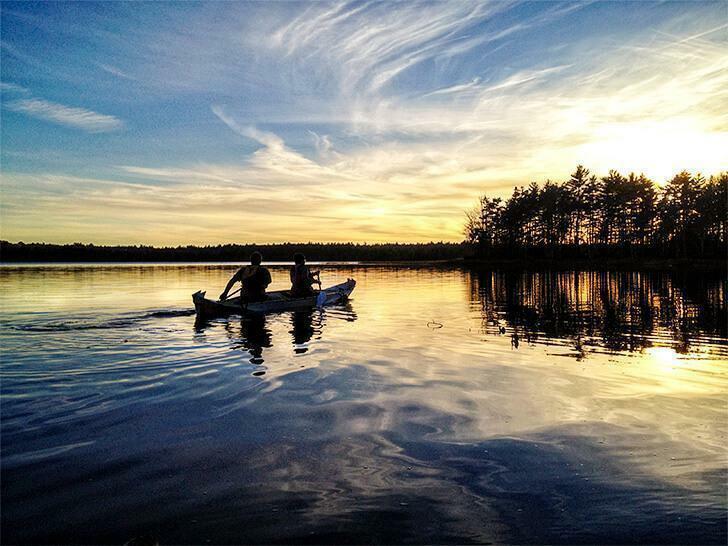 The first round of ONAK canoes have been shipped to crowd-funders and their adventures are shared on a proprietary page on the ONAK website. 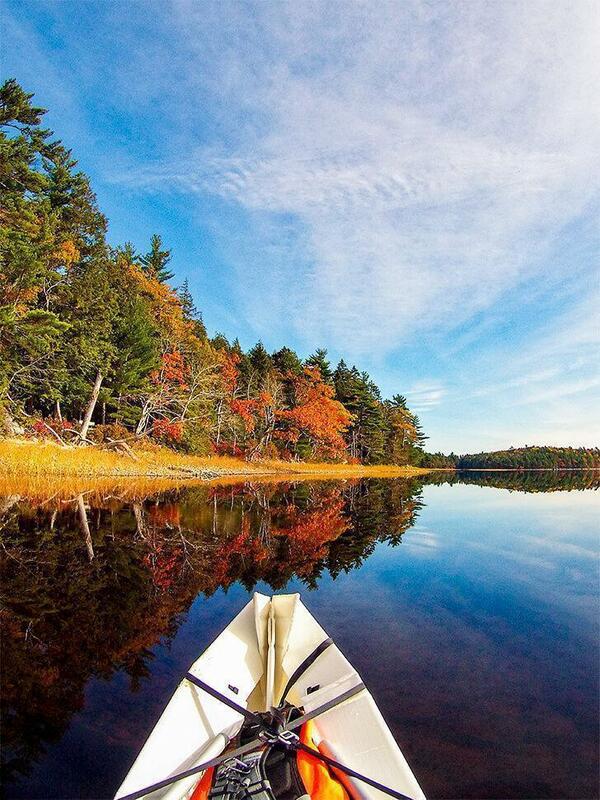 All ONAK owners become ambassadors for the company and can even earn commissions by helping to sell more canoes. So we know the fold up boat looks great and the company scores great points for innovation and ethical business. 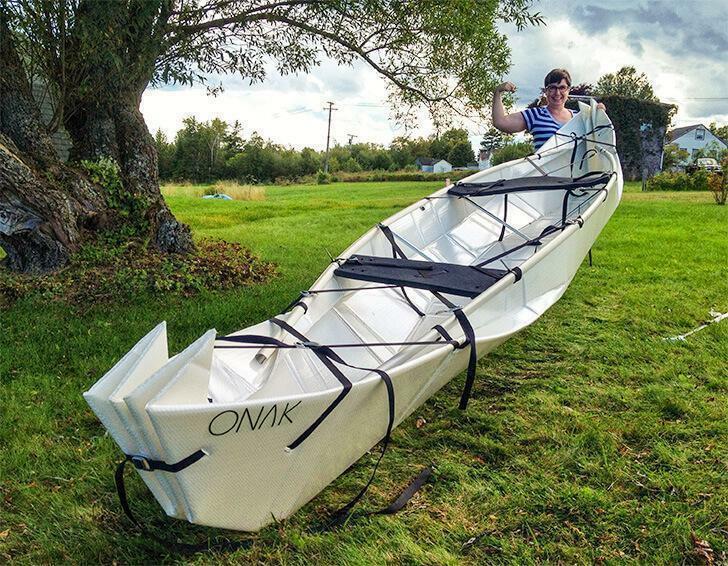 But how does the ONAK canoe actually perform? I apologised as he carried the box up to my Mom’s front deck. “This is nothing,” he informed me. 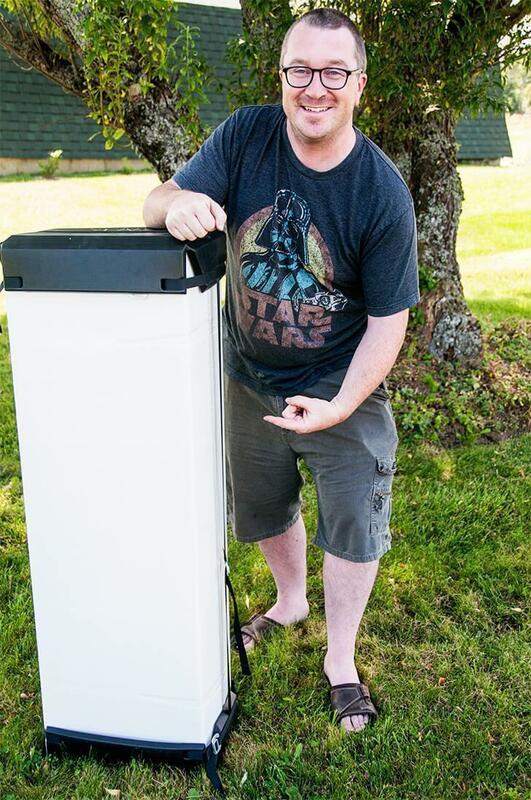 “Last week I delivered an entire home gym. Eight boxes…” My 17kg canoe suddenly seemed pretty small. When Andrew and I unboxed the canoe, we wondered if anything was missing as we didn’t see paddles, seats, or wheels but when we unfolded our ONAK, everything we needed to hit the water was right inside. In fact, the box itself was the canoe. It was one solid piece of material with a number of nylon straps and metal buckles. The only separate pieces were the two seats, two paddles, two lids for the box, and the wheels. It’s an entire canoe setup in one fully contained box. The ONAK unfolded is one solid sheet of material. This was our second setup attempt and we drew a crowd of onlookers. Our contact at ONAK was Dominique, one of the company’s partners, and he was upfront about the initial challenges users have with the fold up boat. He had agreed to walk us through our first set-up via Skype and warned us the first time would be difficult and likely take much longer than the advertised 15 minutes. While we didn’t take as long as some of the attendees of ONAK’s workshops held for new users, it did take us over two hours to build our canoe the first time. Luckily it gets easier. It took two hours the first time but we have a portable canoe! The issue the first time around is the stiffness of the patented Honeycomb – CurvTM polypropylene material when it is first folded. Dominique assured us the ONAK retains a memory of the folds and recommended we leave it in its ‘canoe shape’ for a couple of days. Sure enough, each time we’ve put it together since, the creases have folded easier and we’ve become more confident in how to put it together. Our second attempt at constructing our ONAK was under pressure. While we were visiting the Miramichi area of New Brunswick, word had gotten around of our unique canoe. Although we still weren’t quite confident of our origami canoe folding skills and we were on a tight schedule, we really wanted to get the ONAK in the water and see if she would float – and float she did. We had a quick paddle in the river beside Beaubears Island historic site and were surprised how stable our ONAK felt on the water. We handed over our paddles to a local canoe instructor and he took our ONAK for a (much more capable) spin. He was suitably impressed. The ONAK gets a professional test-drive at Beaubears Island. Since our initial test, we’ve grown increasingly more confident and efficient in our ability to construct our canoe. We’ve gotten our build time down to around 20 minutes and our packing up time to five. We also feel much more confident on the water. We’ve paddled through too shallow waters, scraping the bottom of our ONAK with zero damage. Andrew has gotten in and out of the canoe repeatedly, without tipping me into the water. We’ve even battled some rapids and strong winds without ending up in the river. 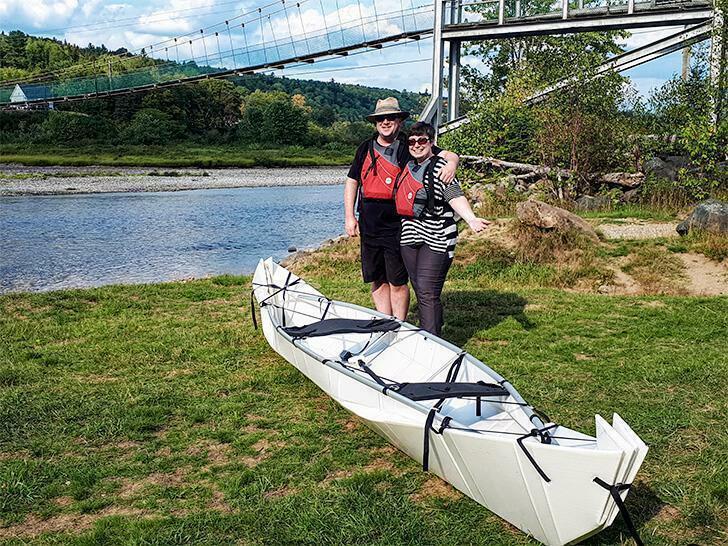 In short, we’re impressed and a little in love with our collapsible canoe. 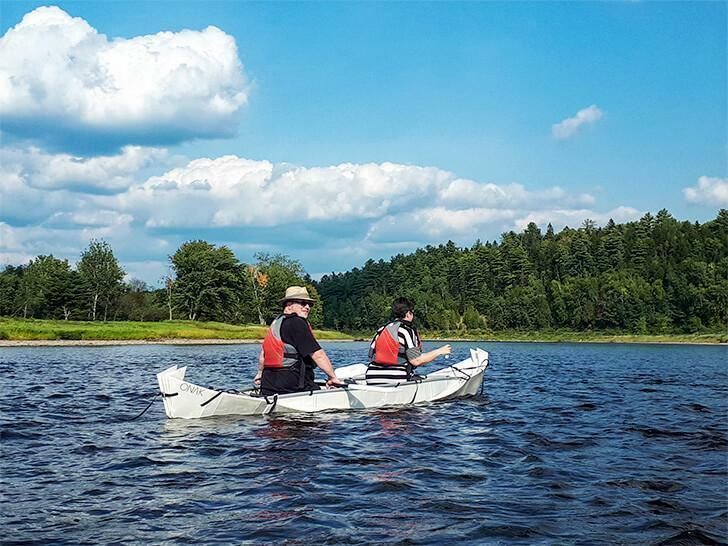 We put our foldable canoe through its paces on the Miramichi River in New Brunswick! So is it perfect? Not quite yet. Our model of the ONAK is still the prototype and it has one flaw – the seats don’t stay buckled. It’s not a huge issue as we don’t tend to use the seats anyway but it can be annoying when they come undone as we’re building the canoe. The folks at ONAK are busily working on a fix that will appear on future versions. Our one top tip would be to carry a small rubber mallet in your folded up ONAK. We’ve found this helpful for ensuring our gunwales are firmly secured. For our needs the ONAK is perfect. It’s easy to store in our motorhome. It’s light enough for us to wheel through campgrounds and parks to get to a good canoe site. It holds both of us plus some gear. And, now that we’ve had some practice, it doesn’t take too long for us to put it together. The ONAK canoe price is regularly € 1.295,00 ($1,295.00 USD or $1,595.00 CAD) but it’s on sale for € 1.095,00 ($1,095.00 USD or $1,345.00 CAD) until December 3rd, 2017. If you order your ONAK through our link, you’ll get a free waterproof bag to keep your gear dry and we’ll get a commission at no extra cost to you. We’ll be sharing more of our ONAK adventures around Canada in upcoming articles as well as our social media channels. 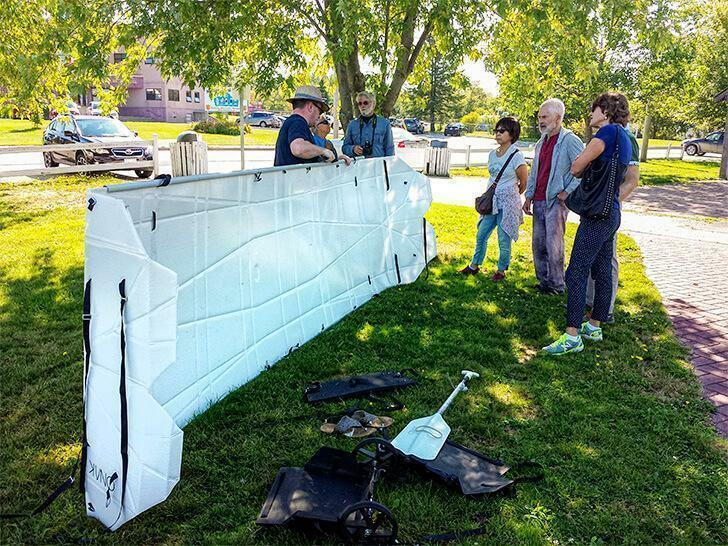 If you have any questions about our folding canoe, as always, feel free to contact us. 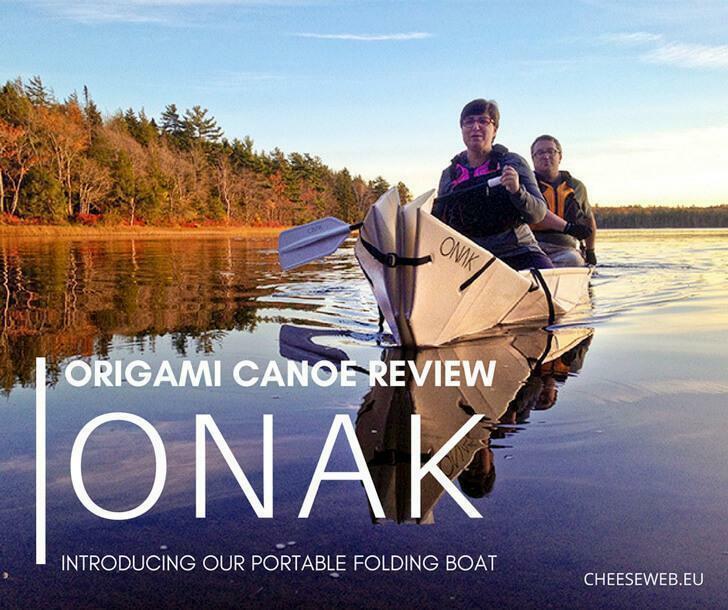 We’d like to thank ONAK for supplying us with their origami canoe to review. As always, all opinions are ours alone and we only recommend products we truly love. The ONAK is definitely one of them!